This imagined greenway for the pollinators navigates a challenging urban landscape to create a new prototype that can be real in its ecological composi-tion. 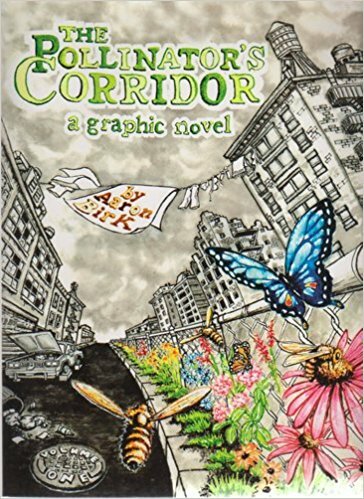 A unique combination of art and prose set against a rebellion against accepting the conventional and oft-described urban decay, Birk paints a hopeful and imaginative tool for urban design, rooted in science and biology. The Pollinator’s Corridor captures the daily lives and aspirations of city residents who share the varying yet common thread of a vision for green urbanity — a vision that’s painted in their imaginations as an environ unabashedly urban yet used at a thrumming pace not just by its human inhabitants but by our pollinators. The book’s evocative illustrations capture the imagination of its characters that are working within their daily lives to paint that picture. Birk’s characters are representative of any or all of us – from the woman jumping into her local YMCA pool at the end of a tiring day to the artist looking for a yet bigger canvas, all looking for nooks and crannies, waterfronts and vacant lands, to plant the seeds that will welcome the pollinating communities into the city.